It’s been a long Winter, and we’re a few weeks away from Spring grass coming in; which means hay is in short supply in Middle Tennessee….so what options, do we as horse owners have, and why is it important to make sure our horses have adequate hay supply? Forage is absolutely essential to maintain proper function of the horse’s digestive system. Nutritionists recommend feeding 1.5-2.5% of a horses body weight in hay. For the average 1,000lb steed, that means you need to plan on 15-30lbs of hay a day! When we plan for Winter for our Safe Harbor herd, we use this calculation, and actually plan on 1.5 tons of hay per horse. No, planning is wonderful but if you’ve run out of hay or had no ability to store hay, what options are available? Most Co-Ops still do have square bales. You’ll pay a premium this time of year; plan on $12 a square bale or $50 a round roll—but expensive hay is far better than no hay. If you don’t have a coop available, there are alternatives at feed stores and tractor supply. If you choose an alternative hay source, be sure to allow time for soaking. Pellets and cubes are recommended to be soaked between about 15 minutes to 2 hours at a 2:1 water to forage pellet or cube ratio. Avoid soaking for long periods of time on hot days, or your valued investment may go rancid or have mold growth. In a freeze, you’ll be chopping up a hay ice block. Thankfully in our Spring Weather we don’t have too many hot or freezing days, but it is best not to soak for more than half a day. Want to stick with a feed and not a hay alternative? Look for a COMPLETE FEED. Most senior feeds will include feeding instructions for complete feeding. These are feeds that are formulated to be digestible for horses who can no longer chew hay, or for other reasons should not eat hay. Complete Feeds are designed to be the sole food source for your horse. Follow the instructions on the bag for how to keep your horse healthy on a non forage diet, and plan on feeding 12-18lbs a day in multiple feedings throughout the day. 1. 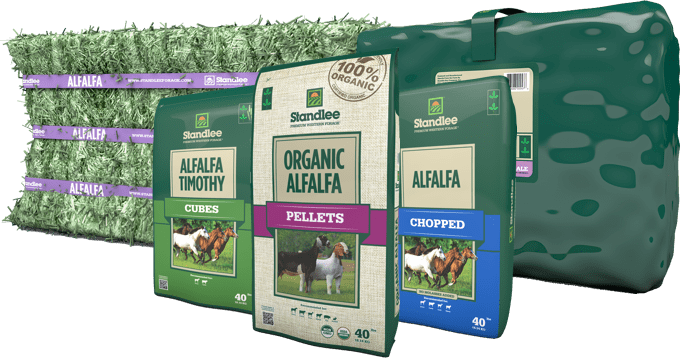 Question – Won’t cubes and pellets cause my horse to choke? Answer – This is a common myth that comes up time and time again. Choking has nothing to do with the format of the forage and everything to do with feeding behavior. Horses are often meal fed, which creates uncertainty for the horse of when they’ll get their next meal. Regardless of the form, they might inhale it, which causes choke. It is important to feed at ground level, allowing the horse to extend his neck in his natural grazing position. Soaking cubes or pellets two parts water to one part pellet/cube for 15 minutes to 2 hours can help slow the rate of consumption, but also help with hydration. 2. Question – Doesn’t my horse need long stem forage for proper digestion? Answer – No, horses do not need long stem forage in the diet for proper digestion. However, long stem forage increases chewing time, which increases saliva production, buffering the stomach from acid that can cause ulcers. Horses that do not consume any long stem forage can also develop unfavorable behaviors including cribbing, weaving, manure-eating, and mane and tail chewing. 3. Question – Does the nutritional analysis of the forage change when processed into pellets or cubes? Answer – We don’t use excessive heat and steam to manufacture our products, which is not enough to “cook” the product or cause a loss of nutrients. 4. Question – Why would I feed pellets or cubes over traditional long stem forage? Answer – For horses with dental issues, feeding soaked pellets or cubes are ideal as they are softened and require less chewing and grinding. This will allow them to consume needed nutrients to meet their maintenance needs. Also, while long-stem forage is great for saliva production, which helps buffer the stomach from ulcers, it is better to feed pellets during the treatment of hindgut ulcers. 5. Question – How do I know the correct amount of cubes or pellets to feed? Answer – Horses should be fed by weight and not by volume at the rate of about 1.5% to 2.5% of their body weight per day in forages. These weights should be measured dry, as when you add water you are only adding water weight to the product. If you feed your 1,000lb horse 2% of their body weight, or 20lbs in long stem forage, an addition of 10lbs of pellets to the diet would in turn leave about 10lbs of long stem forage for consumption. If you are upgrading from poorer hay to a higher quality forage, nutrient utilization will be better and can decrease the amount of grain or supplements needed in the diet.